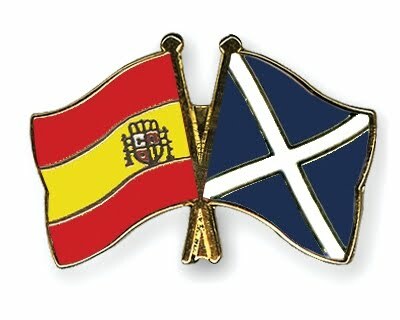 A Scotsman in España - Erasmus 2011-2012: Exams are finished...¡por fin! Finally our 3rd year exams are finished! Most of my exams went pretty well although the Marketing was a tough 2 hours. Now it's time for me to start learning the every day Spanish words that university has failed to see fit to teach us =D Sure I could maybe talk about drugs, education and new communication methods, but I'm not quite so confident with vocabulary like fregadero, cuchillo, lavavajillas and colchón! They obviously just expect us to learn that stuff on our own, which is fair enough I suppose. I've also set my departure date now for the 16th of August! I'm going to San Javier on the coast of Murcia with my parents for a week. Now that the date is official I'm starting to have moments of panic due to the realisation that I'm moving away for a year! I'm really going to miss my family and friends but I know I'm going to have such a great time and people can visit me while I'm there. The amount of forms and paperwork that we have to fill in right now is very frustrating. There are various SAAS forms, passport applications, EHIC cards, insurance forms, university applications and Erasmus forms, all with different deadlines and criteria, which is getting slightly confusing. Some of the forms can only be completed upon arrival and after enrolling in classes, including forms that need to be sent to Glasgow University if I want to receive my grant from the Stevenson Scholarship. Ahh!!! Anyway, I have decided to take a day off of piano teaching on Saturday so that I can (for once) go out on a Friday night with my friends! I'm going to a Mexican themed party at a club called "Stereo" in Glasgow, which I'm really looking forward to. Spanish language music, piñatas, moustaches and ice-cream...what more could you ask for? I'll post again after that, hopefully with some photos. Hola guapo!!! Listen! you'll be fine ok?? hehe I'm sure you won't have any problems and you'll have a lot of fun! hehe, how's the preparation going?. extraordinarily brilliant possiblity to read from here. provide you with a hyperlink on your net blog. you've any? Kindly allow me know so that I may just subscribe. Thanks. Now i'm willing to see this. Here is the sort of guide which needs to be granted and not your arbitrary falsehoods which is at the various other blogs. Thank you for sharing this best file.